As the chyron informed us that, according to a report, churches are "growing across the country," Mike Jerrick immediately worked in the patented Fox News dig at the librul media with his comment about how "The state of Christianity and sometimes how it might be seen negatively in the media" is being counter-indicated by "a report that says the number of churches and church attendance has increased." Dave Briggs reported on a NY Times (anathema to Fox News) article that contends that liberal Christianity has "collapsed." (Birth of a Meme? Nasty liberal Christians are on the decline?) The chyron reinforced the notion that we can't trust the librul media: "Christianity in Crisis, Media's Coverage of Churches in America." Fr. Morris validated the NY Times' Ross Douthat's point that the mainstream Protestant faiths are losing members. (Morris neglected to mention that this is also happening in the Catholic Church which is also closing churches, in part, because of hefty settlements in sexual abuse cases.) While he spoke, images of a Catholic Mass were shown. Morris referenced an article, in the conservative Washington Examiner, which, he said, should have been included by Douthat. Morris cited the article's claim about the awesome growth of megachurches. Morris claimed, without attributing the source which isn't in the article, that 50 million people attended church last week and that's more than the number of people who stood in a football stadium. (WTF?) He mentioned that some Catholic parishes are in decline while others are increasing because of increased participation by laity. (Priest shortage anybody?) He got excited when he cited the article's stat (based on the author's conjecture) that 30% of the "millennial" generation attend church. Jesus Christ on a cracker. This black frocked drama queen Catholic priest took advantage of an obviously deranged homeless man and used him to increase church attendance. Shouldn't he, as a Catholic priest who should care about the destitute, have made the bet a contribution to a homeless charity - or just given the man the money - or more radical, taken the man back to the rectory? ("Shelter the Homeless?") Isn't Catholic heaven all based on faith and good works? At least Jesus fed the people during one of his performances. After all the fun, Morris went home to his nice digs at Old St. Pat's. The homeless guy, presumably, stayed in the alley. But then Morris' Fox friends would probably say that charity begets dependence. Ailes knew what he was doing when he selected Morris as the Fox News clergy in chief whose Fox News dramatic stylings make him one, singular sensation! Some say that if this homeless man was more the age of an altar boy that he would have found a place to sleep at Father Spanky’s digs. Librul media, like God, is non-existent in America. 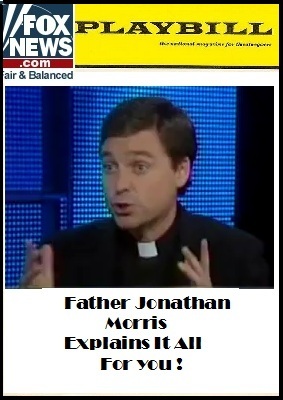 This Father Jonathan Morris — is he a real priest? I mean, does he have an actual parish? If so, I wonder how he can attend to his parish’s needs, what with all the time he spends on Fox News. Plus, I’m certain he’s compensated for his appearances — don’t priests take a vow of poverty? I’m starting to believe this guy is a “priest” the same way Keith Ablowme is a “doctor” . . .